Is the air coming out of the air purifier clean? 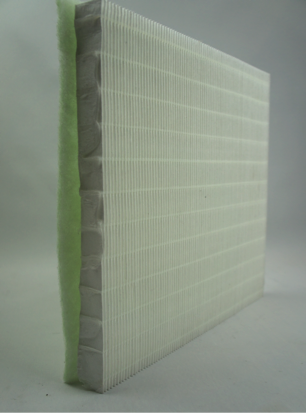 Is the air coming out of the air filter enough to actually clean air in the entire room? How well does it perform compared to expensive air purifiers? 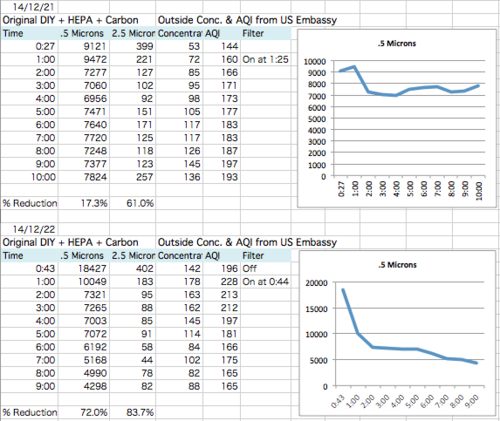 How long will the HEPA filter last? 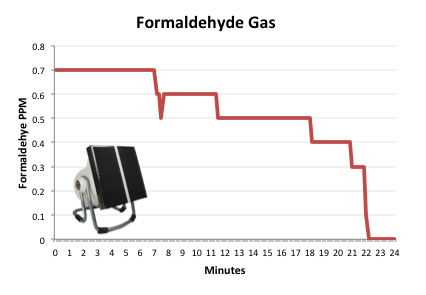 How large a room can the air purifier clean? Do you have to run it all day? Can I turn off my air purifier while I sleep? 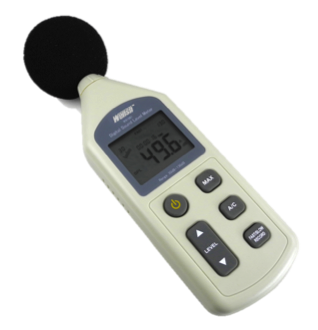 How loud is the air purifier? What happens to a room with no air purifier in it? Has anyone else tested the DIY air purifier? 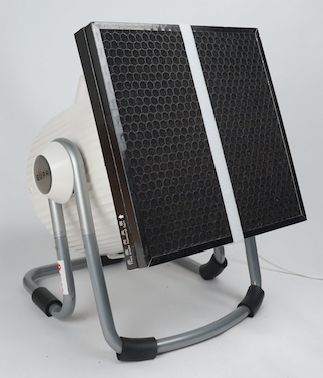 Are all DIY air purifiers the same? 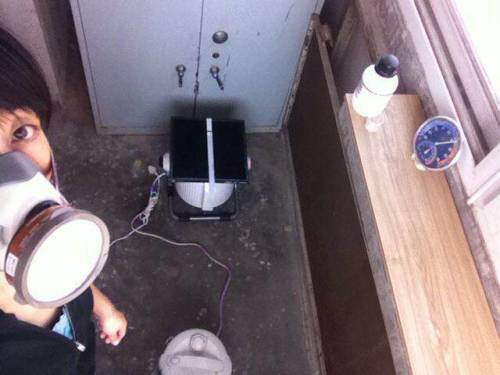 Are DIY air purifiers still cheap in the long run? 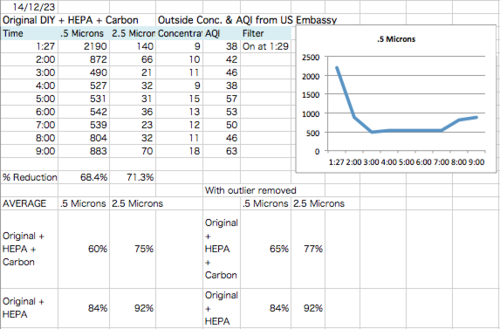 Are cheaper HEPA filters possible? 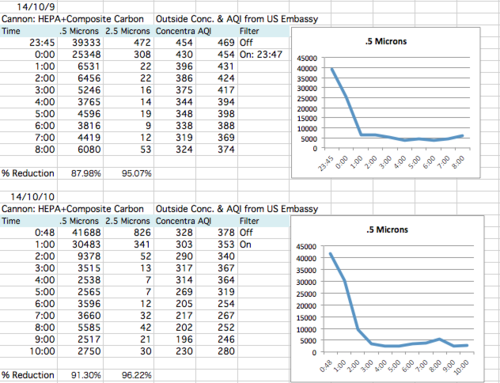 Do activated carbon filters really work? 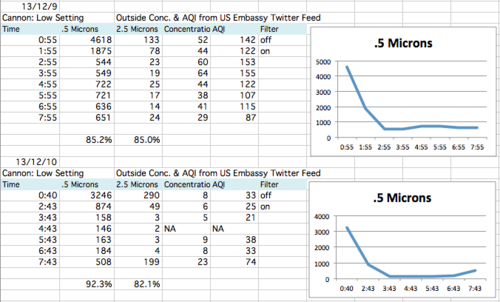 Does adding an activated carbon filter reduce particulate effectiveness? 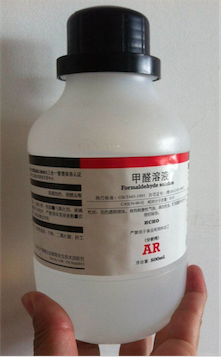 Can an activated carbon filter remove formaldehyde? Here’s where you’ll find answers to questions about air quality, air pollution and air purifier curated by Thomas Talhelm, founder of Smart Air. (Can’t see the video? Watch it on YouTube or Youku). Conclusion: Yes, air coming out of the air purifier is clean. 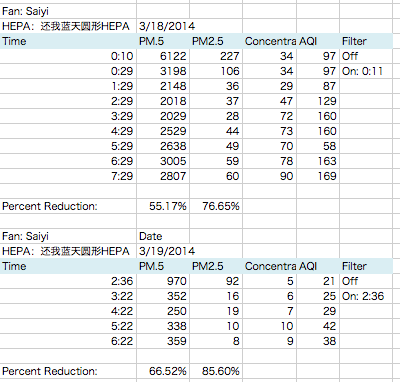 Conclusion: Yes, the clean air from the DIY air filter is cleaning the entire room. I did the test in my bedroom with the doors and windows closed. 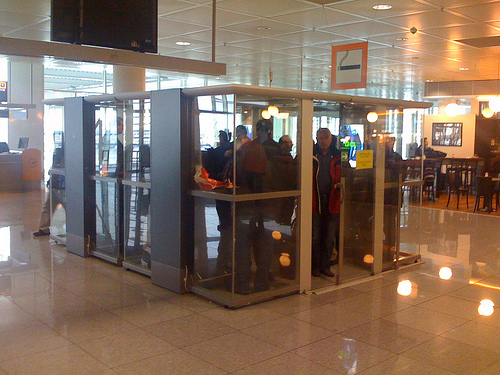 The room is 13.5 meters squared, with two windows. The spike at the top was when I entered the room to turn the air purifier on and reset the machine, so it may be the dust I kicked up by walking around. A more stable reading for that time would probably be about 230. The uptrend prior to turning the filter on may have been because I was running a dehumidifier (which itself has some small filters) in the room before the tests. 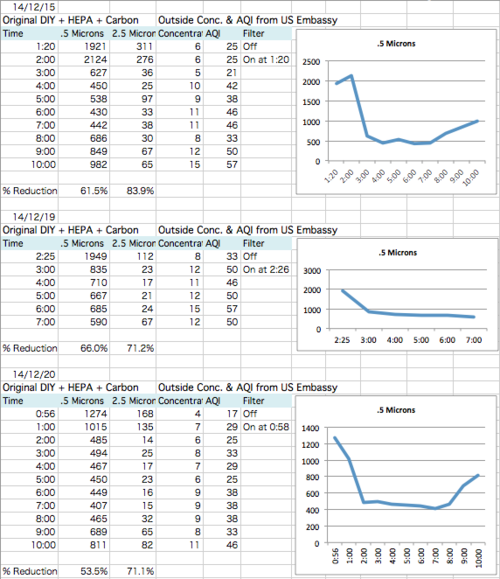 After a few kind souls donated a BlueAir 203/270E (3,600 RMB), a Philips AC4072 (3,000 RMB), and an IQAir Health Pro (8,000 RMB) I was able to test the DIY against expensive brands in the same room, for the same amount of time, with the same particle counter. To do that, my collaborator Anna ran 11 overnight tests with the BlueAir, 9 tests with the Philips, and 11 tests with the IQAir. 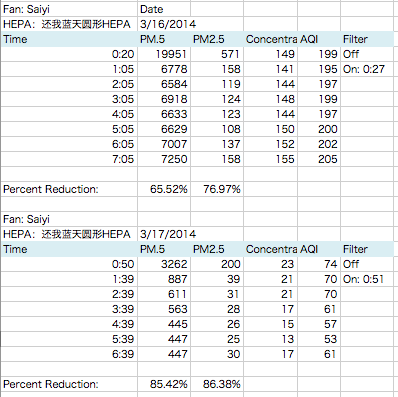 I calculated effectiveness as percent reduction in particulates from the room air. 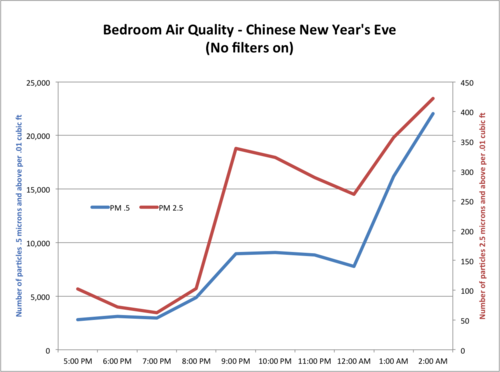 Anna tested the air before she turned on the air filter, and then set the particle counter to take hourly measurements of the air in her 15m2 Beijing bedroom. Anna used the highest setting on each filter. 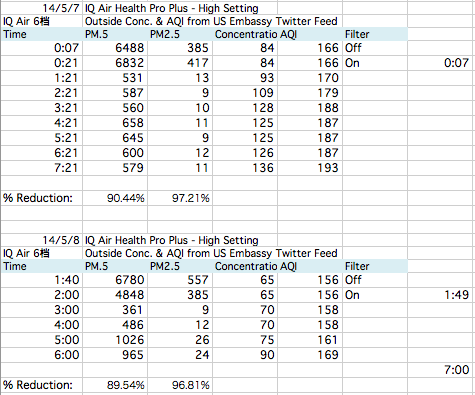 All of the filters significantly reduced particulates, but the 470 RMB Cannon air purifier removed as many particles as the highest-performing big brand. 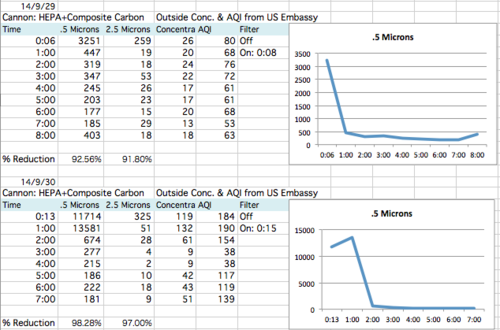 Even the 200 RMB Original DIY air purifier was only 6% behind the Blue Air on the .5 micron particles and 4% behind on the 2.5 micron particles. 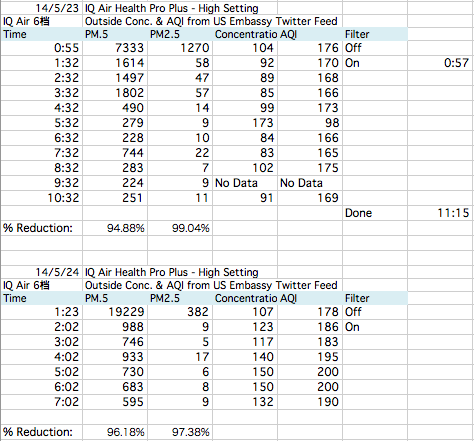 Conclusion: You can remove particulate pollution from the air in your home and pay far less than the cost of a Blue Air, Philips, or IQAir. 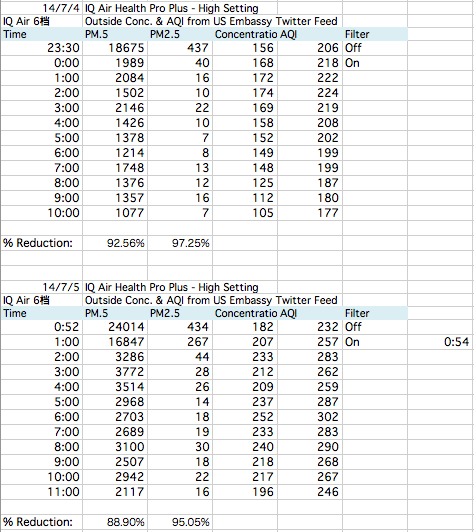 Machines: Anna tested an IQ Air Health Pro (8,000 RMB), Blue Air 203/270E (3,600 RMB), Philips AC4072 (3,000 RMB), Smart Air Original, and Cannon air purifier (Taobao). 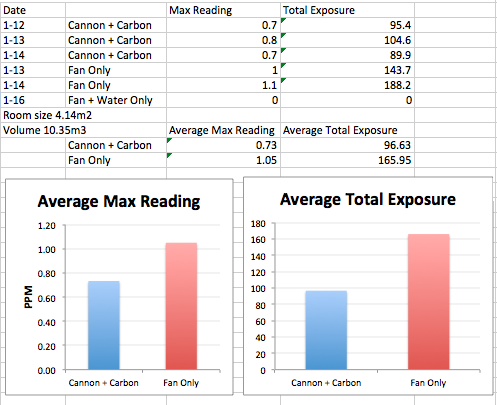 Data: Raw data for the Cannon, Blue Air, and Philips are in my previous post. 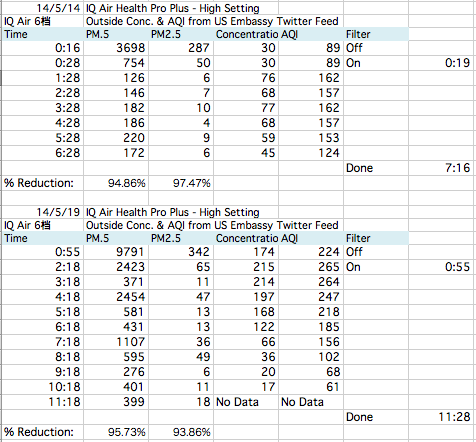 Raw data for the IQ Air tests are below. Outlier: Of the 11 tests, one day was a strong outlier. 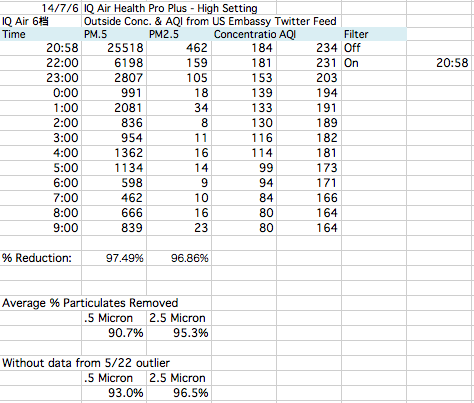 On May 22nd, the IQ Air got only 68% of the .5 micron particles. 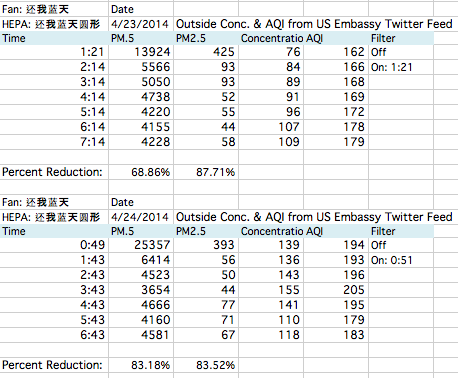 Normally when I see poor results, it’s because the outdoor air got a lot dirtier during the night. 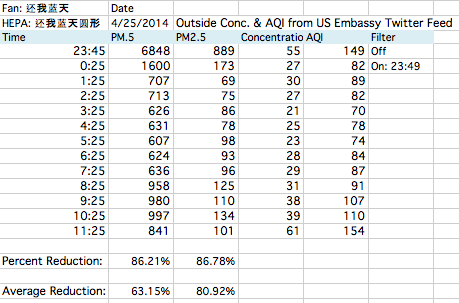 But on May 22nd, the outdoor concentration fluctuated between 74 and 110 micrograms, which isn’t out of the ordinary. Because I couldn’t see any reason the results were poor that night, I left the data in. 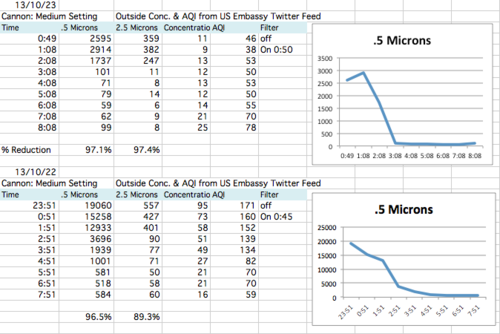 If I redo the analysis with that day included, the results are only slightly better: 93.0% of .5 micron particles and 96.5% of the 2.5 micron particles. That would put the IQ Air about equal with the Philips and still 4% below the Cannon. I recommend replacing your filter after 140 days of use at 8 hours a day. Around Day 100, effectiveness dropped 4%. Around another Day 140, effectiveness dropped another 5-10%. But for the benefit of science, Gus risked his own lungs by continuing the test for another 60 days. 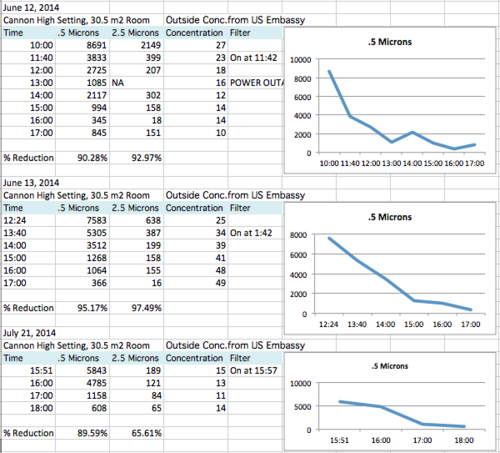 Gus turned on the Original DIY while he slept each night and tracked effectiveness using a Dylos particle counter. 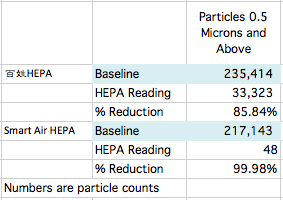 I calculated effectiveness as the percentage decrease in the number of particles .5 microns (and above) over the course of the night. To smooth out variability over time, I averaged the effectiveness over every 10 days. For the full details on the methods, check out my earlier post. At Day 200, effectiveness dipped to just below 50%. At this point, at the risk of Gus’s health (especially given the coming onslaught of winter air), I voted for Gus to stop the test. 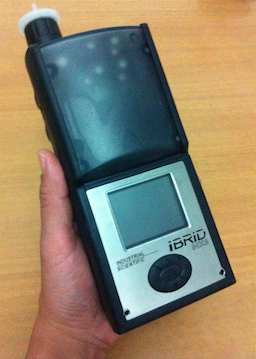 Conclusion: In real Beijing air, the Smart Air HEPA lasted at 100 days at about 8 hours a day at full effectiveness (729 hours to be exact). 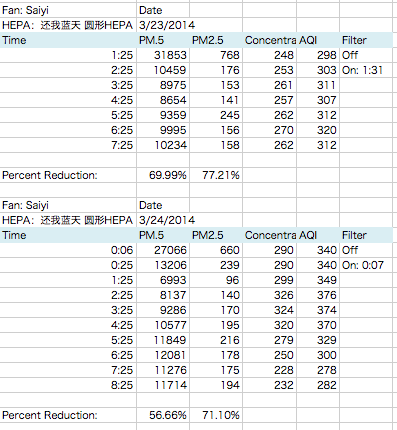 It lasted through 140 days (1,028 hours) with a slight 4% drop, which is when I would change the filter. 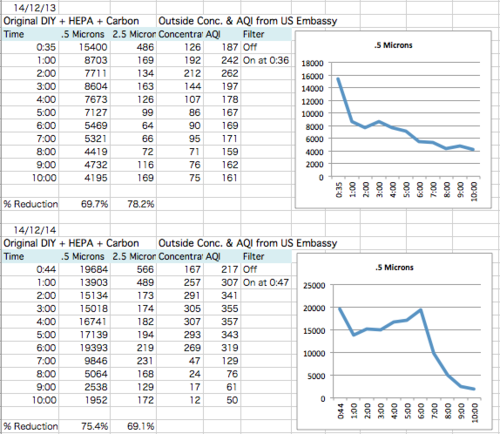 Recommendation: I recommend changing the HEPA every 140 days at about 8 hours a day or every 1,000 hours. You can adjust the number based on how many hours you use it per day. 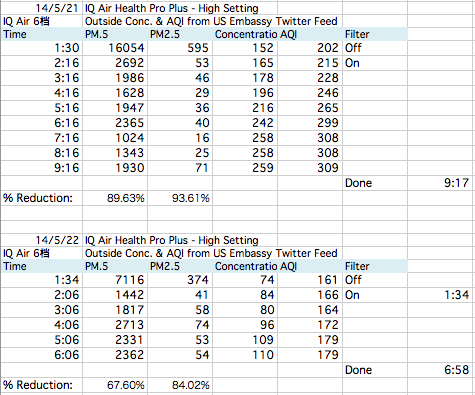 Limitations: Gus did the test in Beijing, so HEPAs probably last a few more weeks in places with cleaner air (but still not clean air”) like Guangzhou and Hong Kong. The results may also be different for the Cannon because it pushes more air. The next longevity test will be with a Cannon! 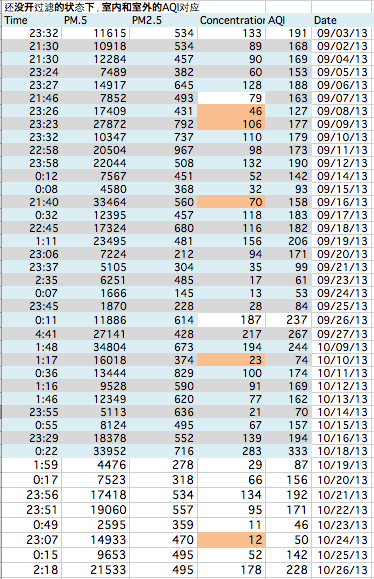 As always, I’m publishing the raw data — all 200 days! How large a room can it clean? The Original DIY is effective in normal-sized bedrooms (up to 15 m2) and the Cannon can handle larger spaces. 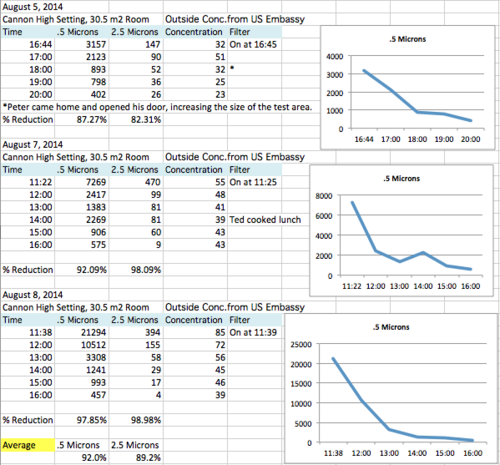 In the summer of 2015, I lived in a large 4-bedroom apartment in Beijing, with a 30.5m2 living room. 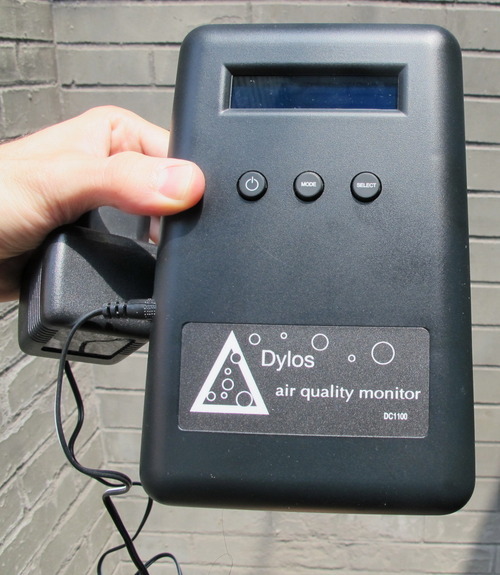 I tested the Cannon six times on high and tracked particulates with a Dylos particle counter. Each test lasted at least three hours. 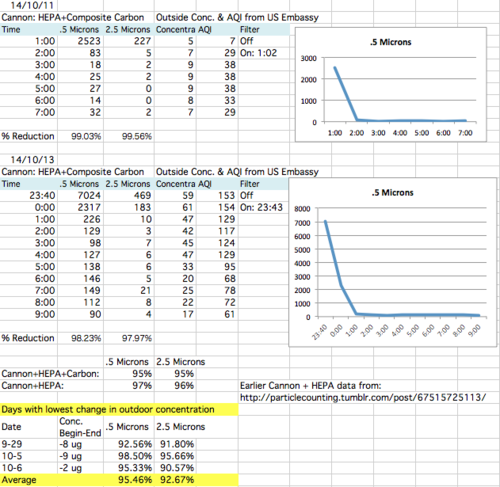 I calculated the percentage reduction in particles from the first hour to the last hour. 1. These tests were run in the daytime. 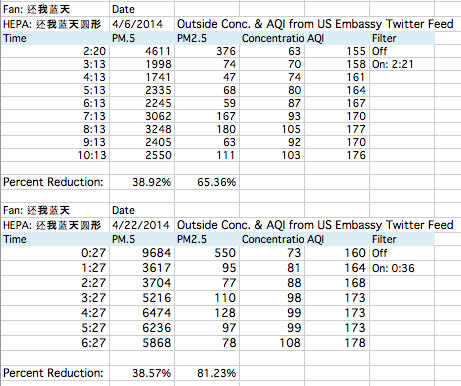 Several people have the intuition that pollution goes down at night because people are less active and fewer cars are on the road (but the data shows that intuition is false — PM 2.5 pollution is worst in the middle of the night in Beijing). 2. These tests were run while people were moving around in the room and opening the door to the outside. 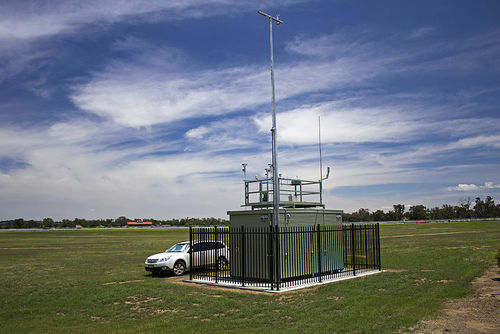 This is more conservative than the nighttime tests because the Cannon has to fight influxes of outdoor air. Over six tests, the Cannon removed 92% of .5 micron particles and 89% of 2.5 micron particles even with people moving around and opening doors. 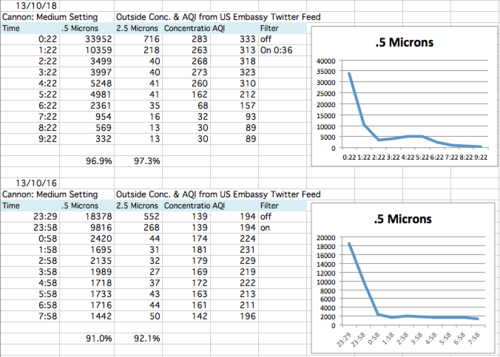 In previous tests, 2.5 micron reductions were usually slightly larger than .5 micron reductions, so it’s a little surprising that the 2.5 micron reduction was 3% lower than the .5 micron reduction. 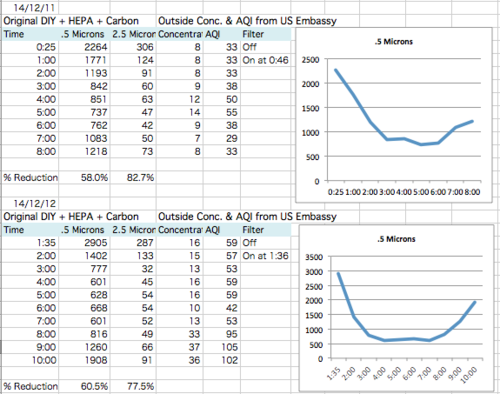 My guess is that this is because people were moving in the room, and human movement affects the 2.5 micron readings much more than the .5 micron readings. The Cannon can clean rooms at least 30.5 m2, which puts it above the 22.3 m2 Blue Air recommends for their 3,6000 RMB 203 model. Some purifier companies recommend running your purifier all day. But is that really necessary? If so, isn’t that a big waste of your filters and energy? 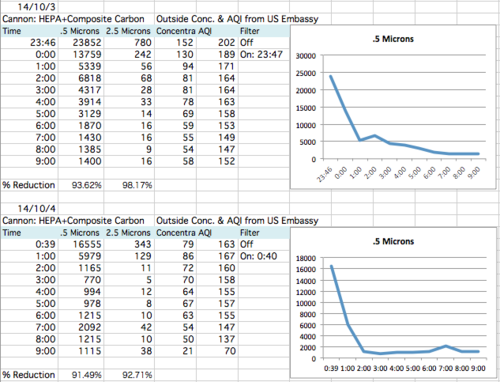 To get to the bottom of it, I set a Smart Air Cannon on a timer to turn on for two hours everyday in a 13.5m2 Beijing bedroom, and I put a particle counter in the room to take measurements every minute. I did the test while I was on vacation, so there was no influence of me opening and closing doors. 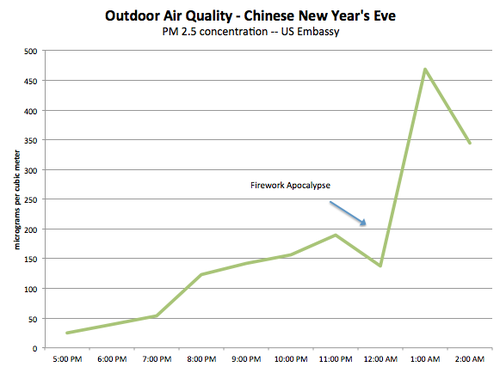 Over the six test days, the air in Beijing became progressively worse. But on each day, it was clear when the Cannon turned on and off. The dropoffs were sharp, showing the Cannon was working quickly. 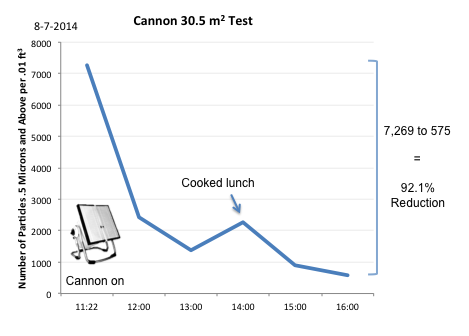 I averaged over the six test days to find out how long it took the Cannon to clean the air on average. 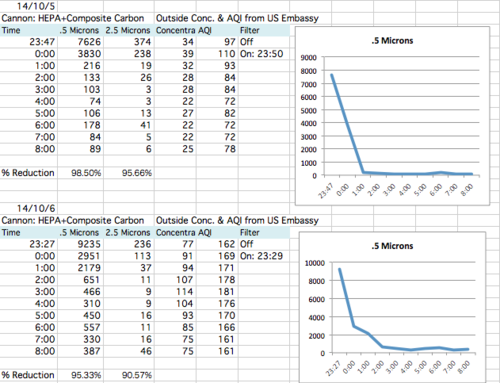 On average, the Cannon cut .5 micron particulates in half in 10 minutes. By 20 minutes, it removed 80%. Bottom line: Powerful purifiers like the Cannon clean the air very quickly, so I see no need to run the purifier while I’m not at home. Can I turn it off while I sleep? The same data from the “Do I have to run it all day” test can also answer another question a few people have asked me: “I don’t want to hear the fan while I sleep, so can I run it for an hour and then turn it off while I sleep? In the tests, the air got dirty very quickly after the Cannon turned off (even though the windows and doors were closed). Dirty air is entering our homes constantly, even though we can’t see it. Bottom line: I do NOT recommend turning the purifier off while you sleep. How do other air purifiers compare?